I finally read Lisa Smith and Lawrence Haddad’s 2015 paper “Reducing Child Undernutrition: Past Drivers and Priorities for the Post-MDG Era.” I’m glad I did. Building on their 2000 paper, the authors explore the determinants of child undernutrition and identify priorities for accelerating reductions in the post-MDG era. As the authors note, in 2011 an estimated 45% of all deaths among children under five was due to undernutrition (Black et al. 2013). For undernourished children who do not die, they are at risk of underperforming in school. Poor school performance places students at risk of diminished lifetime economic capacity, which is itself a risk of staying or falling into poverty. Smith and Haddad reiterate the key importance of income growth, which influences undernutrition at the household level by increasing the ability to pay for nutrition inputs such as food, water, sanitation, and medical care. Higher national income achieved by “a pro-poor pattern of growth” is associated with greater provision of public services (e.g., health services, social protection, and education). 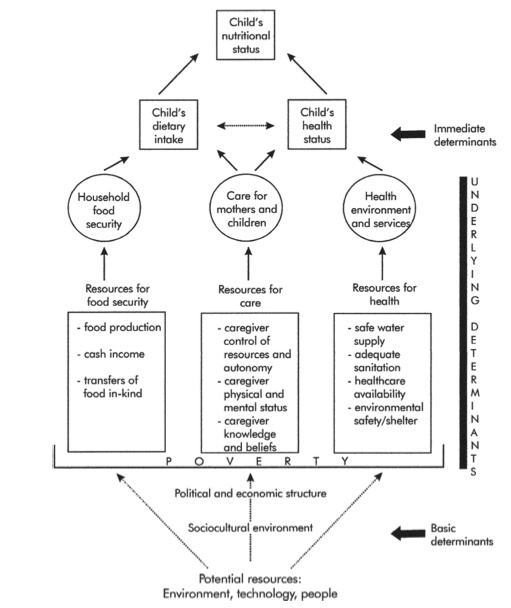 Guided by the UNICEF 1990 conceptual framework on nutrition, shown above, Smith and Haddad draw 8 conclusions. They base these conclusions on a cross-country econometric analysis using data from 116 developing countries collected from 1970 to 2012. All three underlying determinants (food, care, and health environment) contributed to stunting reductions from 1970 to 2010. Increasing dietary energy from non-staples will have the greatest future impact on child stunting reductions, followed by access to sanitation and women’s education. Investments in women’s education, gender equality, and national food availabilities will impact national stunting rates in the short run (~ five years), while investments in health environments and dietary diversity impact national stunting rates only in the long run. Income growth reduces child stunting by supporting access to sanitation, women’s education, and the quality and quantity of food available in countries. Changing the child undernutrition indicator from underweight (in the MDGs) to stunting (proposed in the SDGs) improves the ability to track levels and trends in undernutrition and to identify priority actions for future reductions. This entry was posted in Nutrition & Food Security and tagged nutrition, post-2015, stunting, Sustainable Development Goals, undernutrition. Bookmark the permalink.